1. 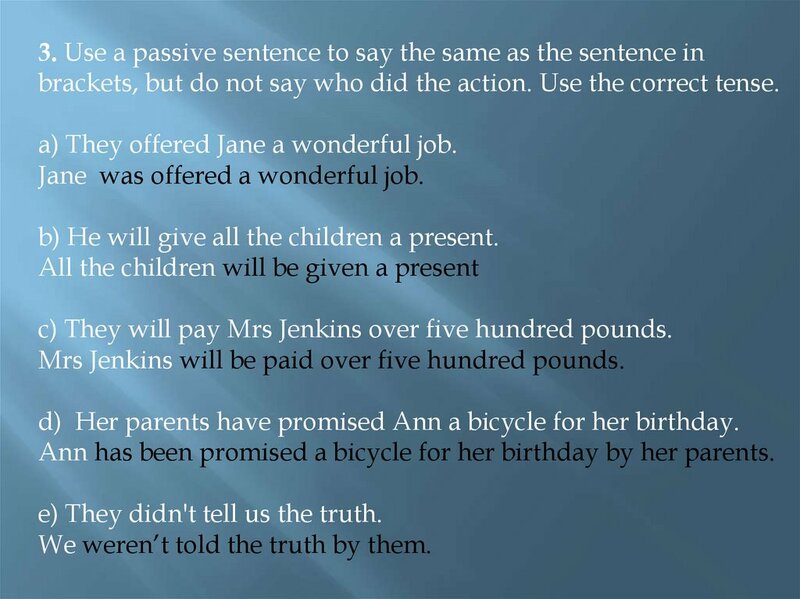 Complete each sentence with a passive verb. a) The police questioned George. George was questioned by the police. b) Millions of people watch this program. This program is watched by million of people. c) They will finish our new house at the end of the month. Our new house will be finished at the end of the month. d) They have elected a new president. 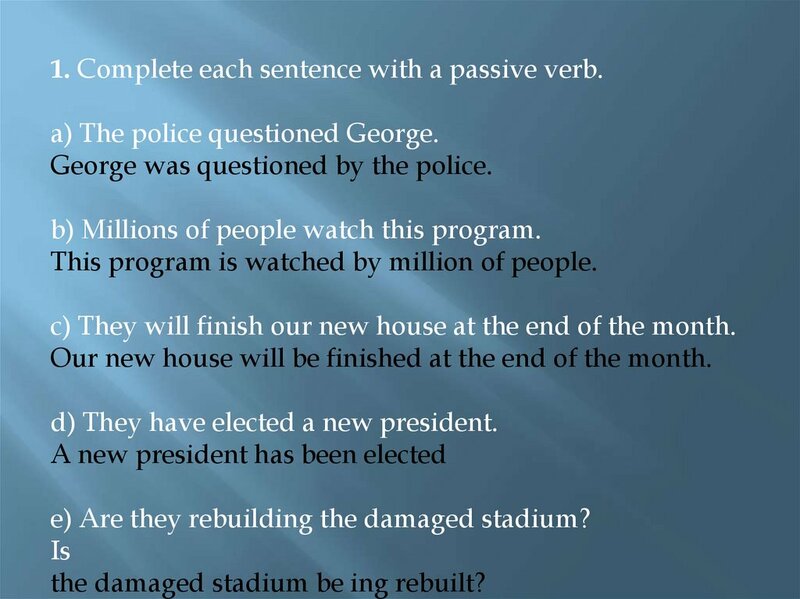 e) Are they rebuilding the damaged stadium? the damaged stadium be ing rebuilt? f) They have closed the mountain road. The mountain road has been closed. g) Students write most of this magazine. Most of this magazine is written by the students. 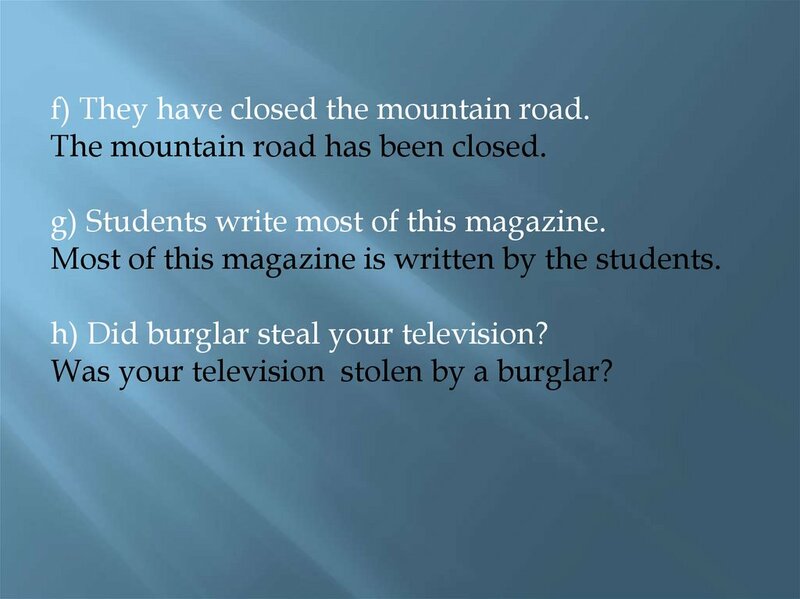 h) Did burglar steal your television? Was your television stolen by a burglar? 2. 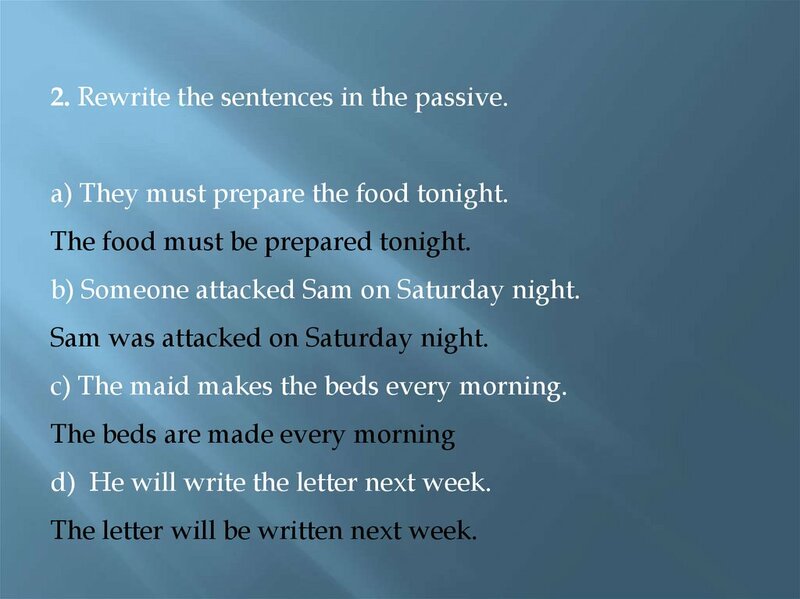 Rewrite the sentences in the passive. a) They must prepare the food tonight. The food must be prepared tonight. b) Someone attacked Sam on Saturday night. Sam was attacked on Saturday night. c) The maid makes the beds every morning. d) He will write the letter next week. The letter will be written next week. e) Gary had finished the project. The project had been finished. f) Catherine is baking the birthday cake. The birthday cake is being baked. g) Did Alison inform the police? Were the police informed by Alison? 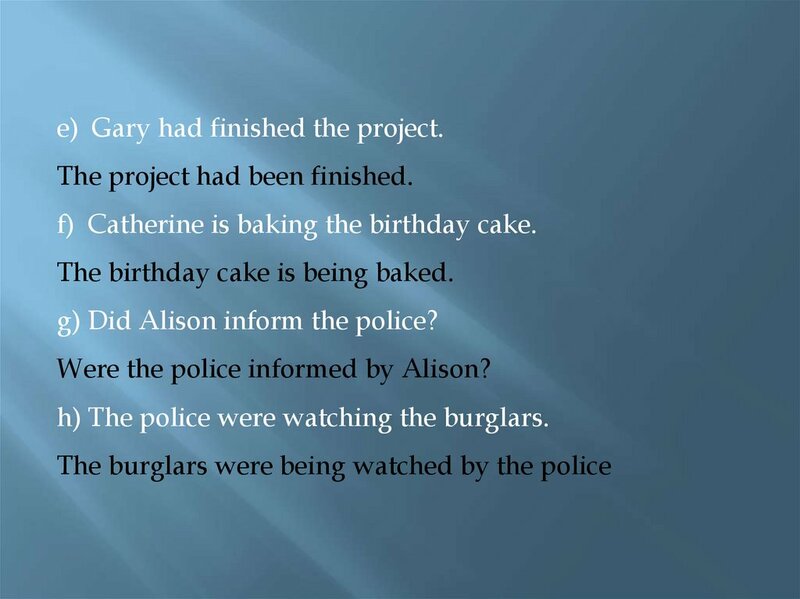 h) The police were watching the burglars. brackets, but do not say who did the action. 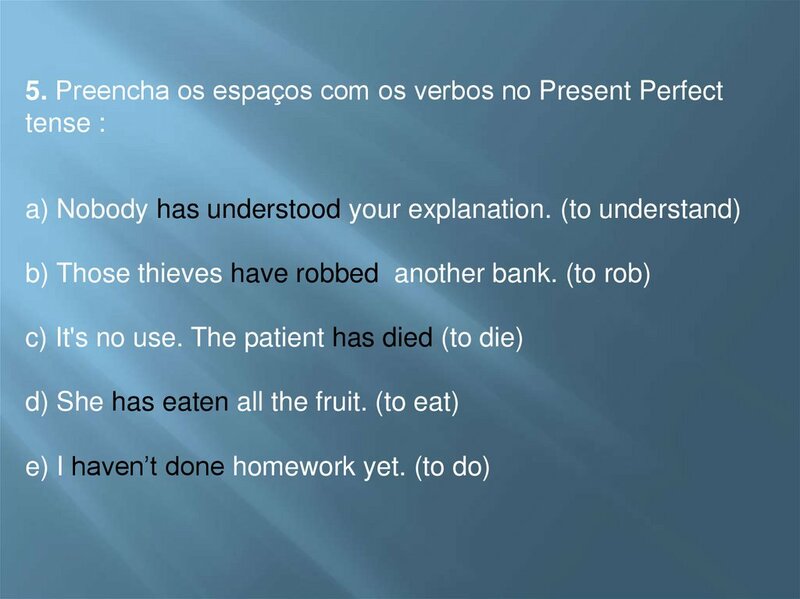 Use the correct tense. a) They offered Jane a wonderful job. Jane was offered a wonderful job. b) He will give all the children a present. c) They will pay Mrs Jenkins over five hundred pounds. Mrs Jenkins will be paid over five hundred pounds. d) Her parents have promised Ann a bicycle for her birthday. Ann has been promised a bicycle for her birthday by her parents. e) They didn't tell us the truth. We weren’t told the truth by them. 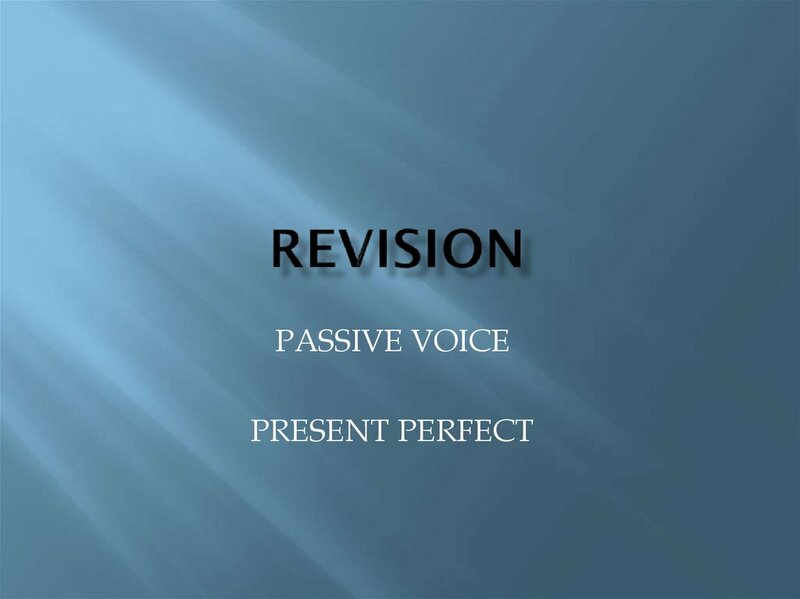 4 .Change to Passive Voice. a) Are they delivering the goods to the buyer tomorrow? Are the goods being delivered to the buyer tomorrow? b) People must keep all pets outside. All pets must be kept outside. c) Should all applicants fill out these forms? Should these forms be filled out by all applicants. 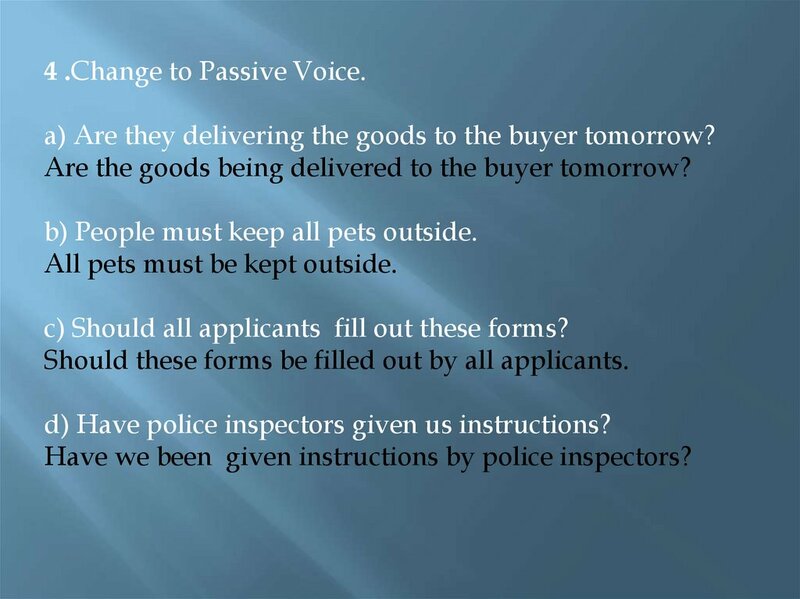 d) Have police inspectors given us instructions? Have we been given instructions by police inspectors? e) Nobody spoke to us at the meeting. We were not spoken to at the meeting. (Não fomos interpelados durante a reunião). f) A policeman stopped us on our way to Cabo Frio. 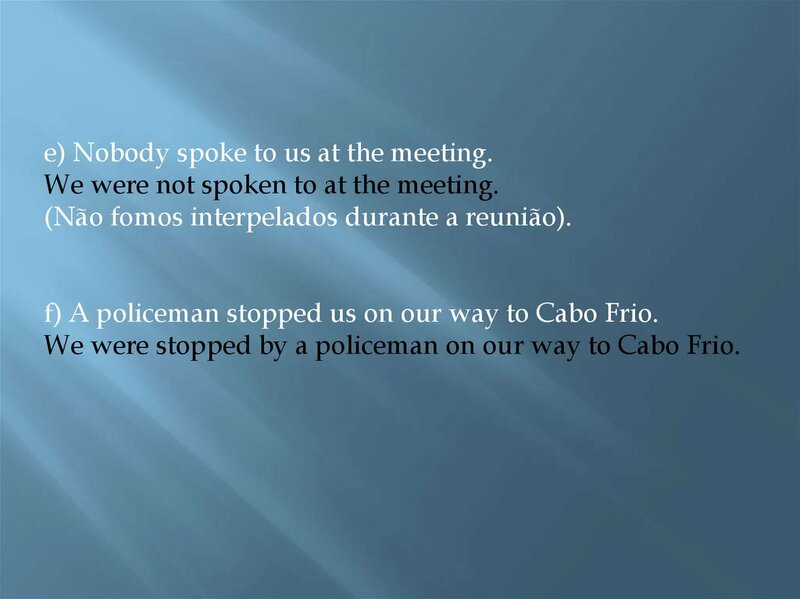 We were stopped by a policeman on our way to Cabo Frio. 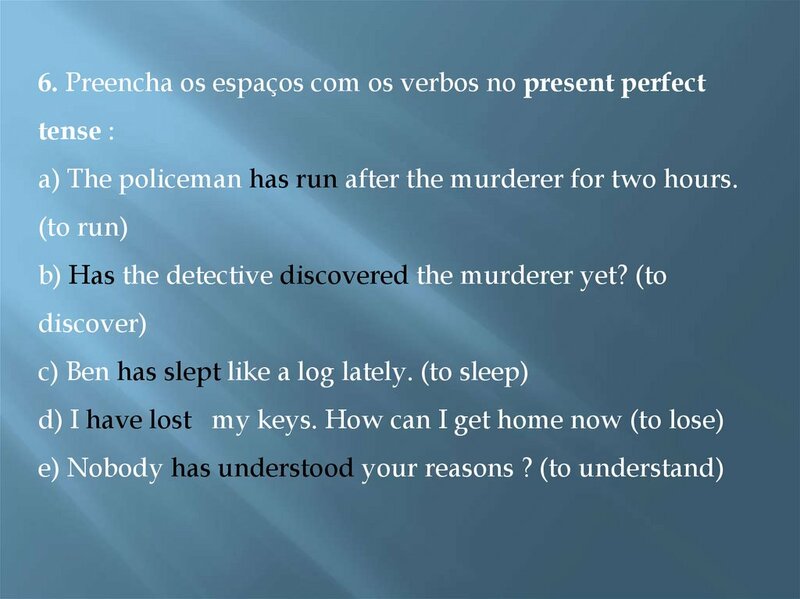 a) The policeman has run after the murderer for two hours. 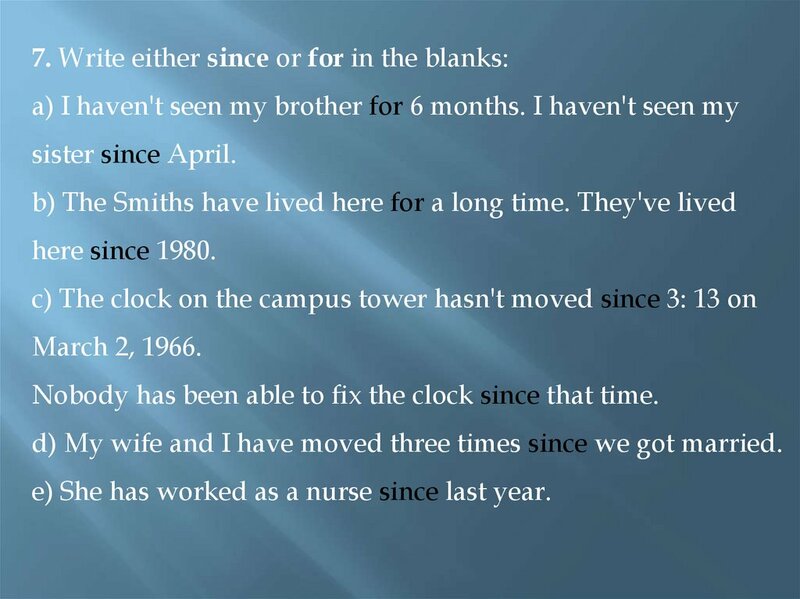 Nobody has been able to fix the clock since that time. d) My wife and I have moved three times since we got married. e) She has worked as a nurse since last year.